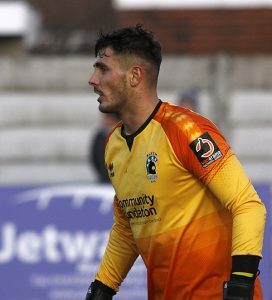 Peter Jameson believes Blyth Spartans’ 1-1 draw at Bradford Park Avenue is a sign of their progression in recent months – although admits Steven Drench’s late penalty save was “a kick in the teeth”. A second-half – where Alun Armstrong’s men led courtesy of Sean Reid’s 26th-minute header – was largely uneventful before the game burst back into life in the final quarter of an hour. Jameson and co were breached via a fortuitous goal from Conor Branson in the 77th-minute after Mark Ross’ header deflected home off the face of the midfielder. The afternoon looked to be heading in the home side’s favour when a few minutes later, substitute Jarrett Rivers was controversially sent off, however it’d be Blyth who squandered a golden opportunity gain all three points. Because in the third minute of stoppage time – Robbie Dale, who became the club’s all-time leading appearance holder (626), was denied a last-gasp winner on his landmark outing with Drench guessing correctly to his right-hand side. And while Jameson rued Drench’s save and his side’s miss chances throughout the 90 minutes, the Blyth shot-stopper insists it is a firm indication of their progress after extending their unbeaten run to 14 matches. He said: “It’s a kick in the teeth because I think first-half – the chances we’ve had and even in the second-half, we sat a bit deep but we’ve had chances to kill the game off. “Obviously with the penalty right at the end and going down to 10 men, it’s tough, but if we reflect on last season and in previousus months, maybe we might have come down here and lost. “This point could be important come the end of the season, plus it keeps the unbeaten run going – which we are determined to do. As pointed out, it’s a quick turnaround for Armstrong’s men, who head to 6th place Altrincham knowing a win will put them in reach of the playoff places, something which looked extremely unlikely just a few months ago. Jameson has backed Blyth to bounce back from the late disappointment at the Horsfall Stadium – now least Dale, whom he was full of praise for. He added: “It’s hard because we got the late penalty decision and you think with Robbie (Dale) stepping up – I would have put my house on him scoring. “But Robbie’s got a great attitude, he’ll bounce back from it 100%. Even in the dressing room now, his head isn’t down, he’s talking to the lads.